I know it seems that Christmas is a distance away yet, but I am preparing early with FabScraps Angelic Christmas collection. - now available in the Flying Unicorns store. The collection takes a wonderful nontraditional approach with purples, greens, creams and an old world vintage appeal. 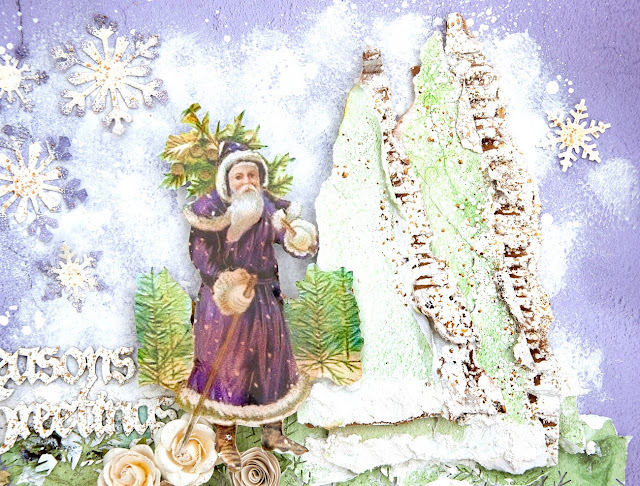 I had a vintage Santa image with an eggplant color thus I selected the purple background . My grass was created as a sort of mistake. I had punched a whole bunch of pine branches out with the McGill pine branch punch to use as a complement to the photo. Then I got to thinking that I really liked the frayed look of the punched paper. So that's the direction my page took. I needed trees of course if Santa is surrounded by a pine forest. I created them out of cardboard and there is a simple step-by -step down below. I finished the layout with some Prima flowers and some rolled ones. Visit FabScraps blog here and LIKE them on Facebook. Thanks a bunch for stopping. As I mentioned, you can purchase the paper collection from Flying Unicorns. 2. 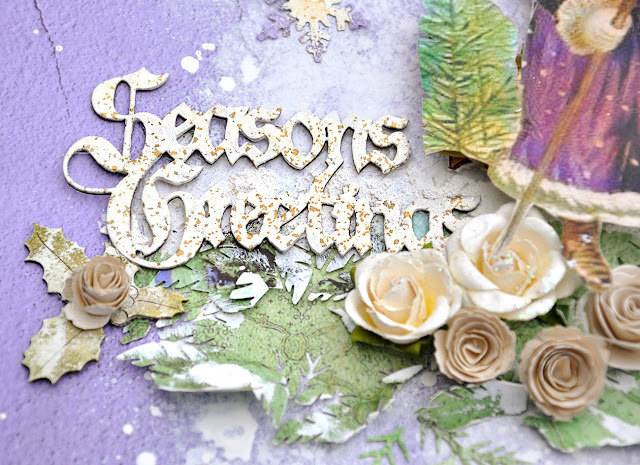 Start with FabScraps Angelic Christmas Collection – Bauble Delight paper C61 001 – paint white paint or gesso onto the center of the page using a foam brush, sea sponge or even blot with paper towel. Make it look like a snowy winter day. 3. Drip white paint or white mist onto the page to look like snowflakes falling. 4. Cut a strip approx 3inx10in from FabScraps Angelic Christmas - Special Delight paper C61 003. Using an evergreen pine branch punch, make several punches along the bottom edge of the paper strip. 5. Glue the paper strip horizontally to the purple Bauble Delight background sheet - starting about 4 inches from the bottom. 6. Glue two of the pine punches to under the paper strip. 7. Ruffle up the edges of the paper strip to look like grass. Lightly paint some white paint or gesso on the paper strip here and there like a dusting of snow on the grass. 9. Cut two triangles from cardboard. One triangle sized 6in x 4in and the second 5in x 3.5 in. 10. Rip the right edge of the cardboard so that the cardboard is jagged and part of the corrugation is showing. 11. Cover the trees with FabScraps Angelic Christmas collection – Special Times paper C61 003. Leave the corrugated edge uncovered. 12. Coat the corrugated edge with embossing ink making a little bit spill over onto the FabScraps Special Times green paper. Cover with white antique embossing powder and shake off excess. 13. Set with heat gun. 14. Layer the trees with the large on the bottom and the smaller on top. Glue to the right side of the page, on the paper strip. 15. Coat the bottom of the trees with snow texture paste. Let dry completely. 17. Cut angel image from photo paper and add dimensional glue dots to the back to make this pop off the page. I use cardboard to back my photo to give it dimension. 20. 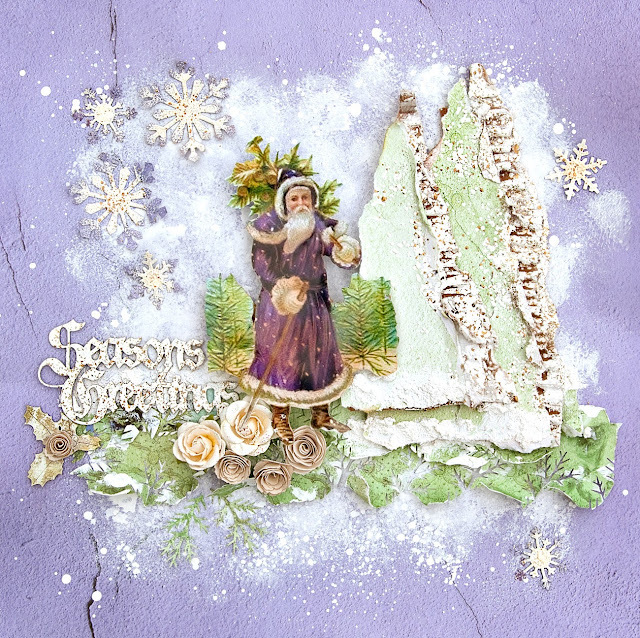 FabScraps Angelic Christmas – Seasons Greetings chipboard DC61 003 – cut the Holly leaves from chipboard and set aside. 21. Apply embossing ink to the chipboard words only and coat with white aged embossing powder. 22. Treat with heat gun. 23. Glue to the paper strip near the left side. 24. Ink the holly chipboard piece lightly with olive green ink and lightly dab with some gesso for a frosty look. 25. Glue under the “Seasons Greetings “ piece. 27. Punch or die cut various sized snowflakes from FabScraps Angelic Christmas Collection – Bauble Delight paper C61 001 . 28. Emboss the center of each snowflake with white antique embossing powder. Heat set and glue to the page. 29. Add flowers under Santa image.